There may be snow on the ground, but spring is finally around the corner! As we look forward to warmer weather, longer days, and fresh greenery, the Play It Out crew is busy planning events and happenings all over our little corner of Montgomery County. First things first: Play It Out will be closed on Easter Sunday so that we can spend time with our families. We hope you enjoy your holiday festivities, whatever they are! On Thursday, April 5th, we’ll be right back to work with our friends at Cardinal Hollow Winery for their Vendors and Vino Event. At this event, you can shop local vendors, buy wine, enter raffles, and play our 5 minute teaser game. If you’ve never played an escape room, and you’re still trying to figure out what they are, our 5 minute teaser game is the perfect introduction. In this quick game, you’ll solve a few puzzles to get to a small prize. You’ll get to see what is so fun about escaping, and you’ll especially learn that anyone can do it! 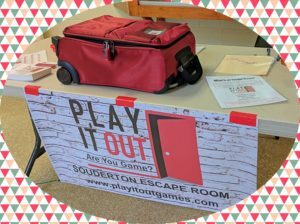 Find us at one of the many events we attend, and you’ll be planning your visit to Play It Out in Souderton in no time. On April 21st, we’ll be at Per Diem Space in Perkasie for their Earth Day Pop Up Shop. We’ll join several talented local vendors at Per Diem, where you can shop and support local business. Then head over to Menlo Park for Perkasie Borough’s own Earth Day event. We’ll wrap up our busy month by joining Generations of Indian Valley as presenters at their Tea at Two program on Wednesday, April 25th. Attendees can sign up for our 5 minute game leading up to tea. At 2:00, we’ll give a presentation about our company. Escape Rooms are quickly becoming a favorite multi-generation family activity. If you are a grandparent in the Souderton area, please join us for this event so that you can plan an escape with your kids and grandkids. Just imagine an entertainment experience where everyone puts the phones away, talks to each other, and works together to solve some puzzles. You all might surprise each other with your quick and creative thinking skills. No grandkids? No problem. Escape as a double date, with book club, or your cards group. Don’t forget about our weekly specials going on all the time. On Thursdays, we offer our “After School Special,” where 4:00, 5:30, and 7:00 bookings are just $20 per person. You don’t have to be a student to take advantage of this deal. Sundays are another day you can play for just $20 per person. Escape with the family, and you just might discover your new family activity! Think spring. Plan your escape from winter at Play It Out today!